James L. Flanagan was born 26 August 1925 in Greenwood, Mississippi. He received the B.S. degree in Electrical Engineering from Mississippi State University in 1948, and the M.S. and Sc.D. degrees in Electrical Engineering from the Massachusetts Institute of Technology in 1950 and 1955, respectively. Between periods of educational training, he served in the U.S. Army (1944-1946), and as assistant professor of electrical engineering at Mississippi State University (1950-1952). Following his Sc.D., Flanagan worked as an electronic scientist at the Air Force Cambridge Research Center. In 1957 he joined the technical staff of AT&T Bell Laboratories. 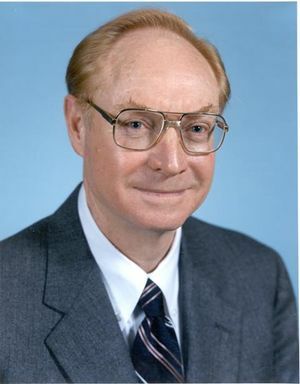 He became head of the Speech and Auditory Research Department at Bell Laboratories in 1961; head of the Acoustics Research Department in 1967; and director of the Information Principles Research Laboratory in 1985. Flanagan' s research career has ranged broadly in digital communications, speech processing, and acoustics. He is internationally recognized for his contributions to voice coding, speech analysis and synthesis, hearing, and electroacoustics. His personal research is documented in over 140 technical papers in scholarly journals, and in 45 U.S. patents. His book Speech Analysis, Synthesis and Perception (1965 and 1972 eds.) has become a major reference in speech communications research. In addition to his individual contributions, Flanagan has directed research at Bell Laboratories in speech recognition, speech synthesis, digital coding, electroacoustics, robotics, and artificial intelligence. His leadership has directly influenced fundamental techniques and algorithms now widely used in digital speech processing. Flanagan is a Fellow of IEEE, a Fellow of the Acoustical Society of America, and has held leadership offices in both organizations. He was elected to the National Academy of Engineering in 1973, and to the National Academy of Sciences in 1983. He has served government, defense organizations, and universities in advisory capacities. He is perhaps best known to the lay public for his work in analyzing the infamous 18-minute gap in the Watergate tapes. Flanagan received the IEEE Achievement Award, the Society Award of the ASSP Society, the IEEE Centennial Medal, and the IEEE Edison Medal in 1986 for "a career of innovation and leadership in speech communication science and technology." He received the Distinguished Service Award in Science from the American Speech and Hearing Association and was co-recipient of the L. M. Ericsson International Prize for notable contributions to telecommunications. Dr. Flanagan is an Eta Kappa Nu Eminent member. in 2005 Dr. Flanagan was awarded the IEEE Medal of Honor for "sustained leadership and outstanding contributions to speech technology." Flanagan died 25 August 2015 and was survived by his wife, the former Mildred Bell; three sons: Stephen, James, and Aubrey; and five grandchildren. His outside interests included salt-water fishing, swimming, jogging, and a friendly game of poker. This page was last edited on 14 August 2017, at 14:52.